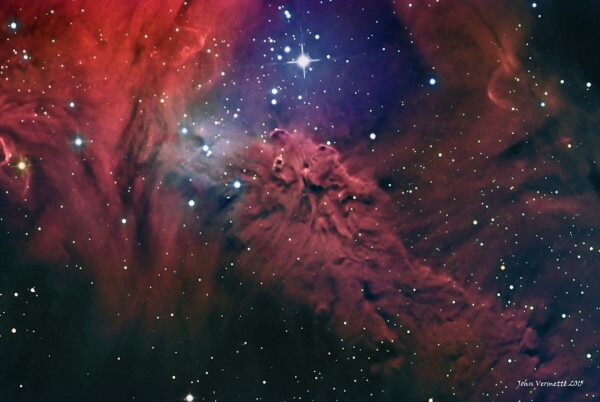 A 2500 light years is a star cluster called NGC 2264, also known as “the Christmas tree”. With around 40 stars, it is formed by ionized gas that gives us the cosmisco that the black powder and red. In the photo, at the top we see the S Mon or Monocerotis, star of the constellation Unicorn is not one, but two. A binary system composed so close together that looks like a single star with orbital period of 20 years (approximately). In fact, the red color you see on the left is the reflection in the cosmic dust of S Mon, something that helps to know the composition of the dust, hydrogen.